Authoritarian movements and governments resurface globally. They are often presented as a shocking aberration from the progressive norm. 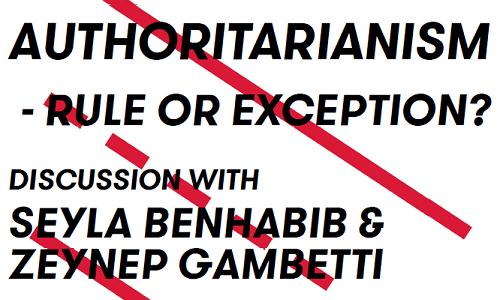 But whether we should see authoritarianism as rule or exception to the present world order hinges on how we explain its emergence, referring, for instance, to the fragmentation of public spheres and transnational institutions, as well as to the rise of neo-liberal financial capitalism and inequality. One common denominator between authoritarianism and neo-liberalism could be seen in the creation of superfluous people, stripped of rights through statelessness, homelessness or other forms of exclusion. How should we reformulate the defenses against exclusion and despotism, such as human rights and citizenship, in order to strengthen pluralist and cosmopolitan modes of democratic participation? And which deeper structures would need to be addressed in order to forgo the lapse into fascist tendencies or autocracy?